Surrounded by the deep blue Caribbean Sea, with warm temperatures and sunny skies year 'round, there is always something to do in Anguilla! You just have to know where to go. 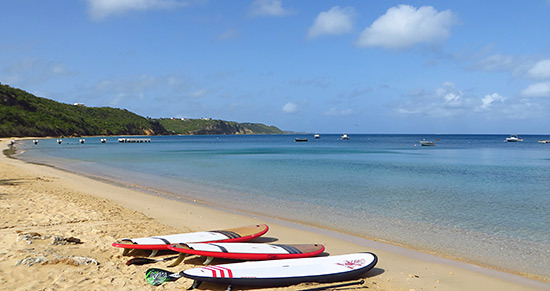 And Anguilla Watersports is the answer for those of us who live for the sea! 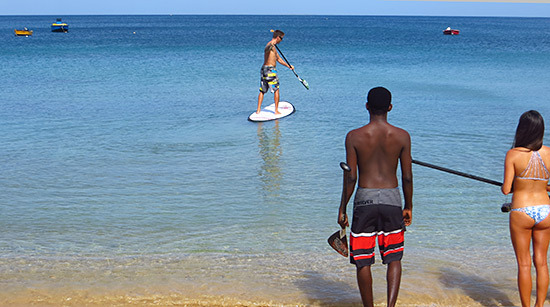 With world-class service, quality equipment and professional instruction, Anguilla Watersports offers some of the most popular water activities right here in Anguilla. 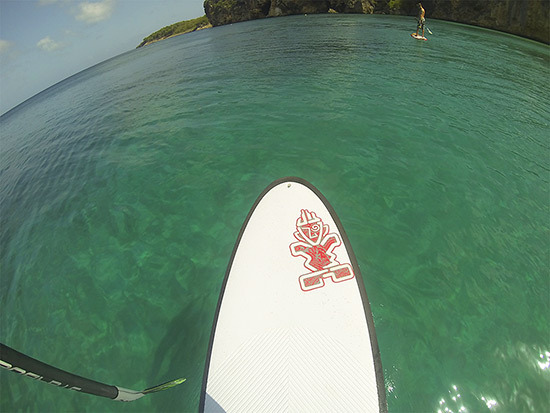 Since we moved to Anguilla in 2008, the Caribbean Sea has become our playground. Whether clear and calm or windy with a few ripples on its surface, nothing beats that exhilarating yet soothing feel after a day spent on the water. A good friend since our pre-Anguilla days, we've known Judd Burdon for years. Growing up in the same area in Canada, today we both live in Anguilla. With a mutual love for watersports and the sea, we have spent many a day out on the ocean surfing, kitesurfing and stand up paddleboarding. Judd is a kitesurfing expert and has always made me feel so at ease in the ocean. A true waterman with years of experience under his belt, he takes on waves and wind of all conditions both in Anguilla and abroad. 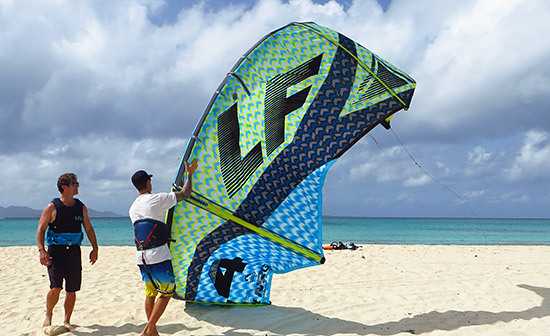 Beyond his wide experience, Judd is also IKO-certified, a certification by the International Kiteboarding Organization that ensures its riders know all of the ins and outs of kiteboarding. So, you can imagine my delight when I heard that Judd was opening his own business... the aptly named, Anguilla Watersports. 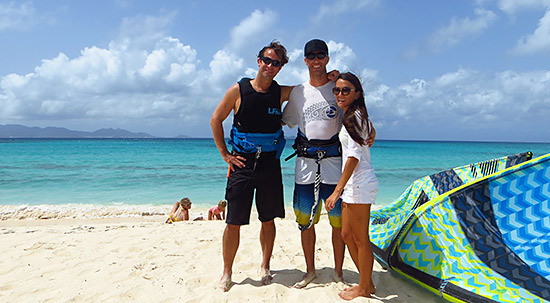 With world-class service, professional instruction and high quality equipment, Anguilla Watersports is all about enjoying the ocean to the fullest and in the safest way possible. 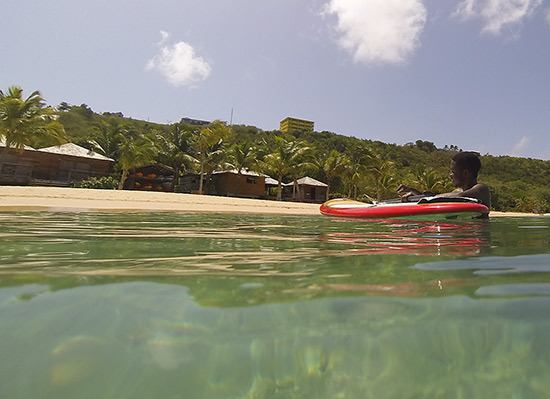 To get an overall feel for Anguilla Watersports, first, take a look at their video below. From Richard Branson to Leonardo DiCaprio, kitesurfing has rapidly gained an increasing number of enthusiasts over the years. A little known secret, despite its popularity? 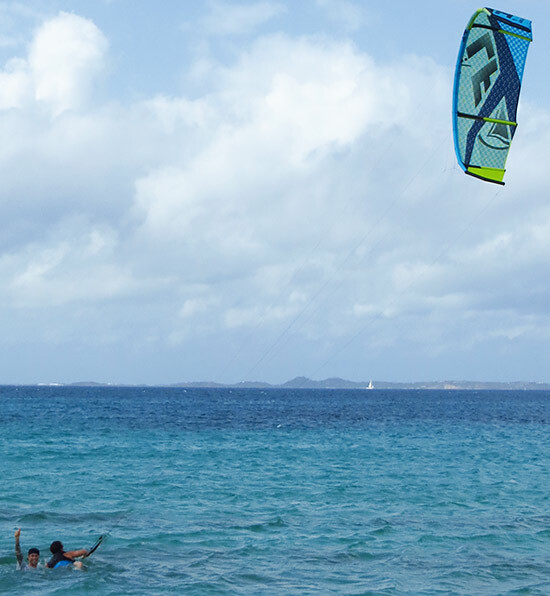 Anguilla is one of the best spots to kite. Together with an all-star team, Judd Burdon delivers lessons to all skill levels. 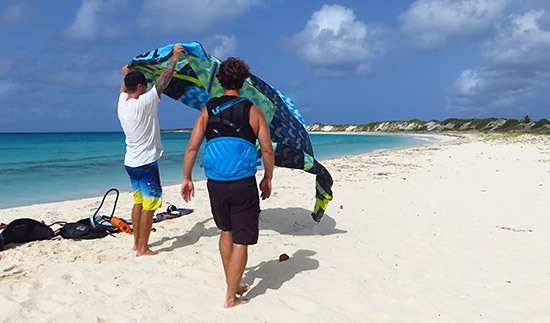 Whether you have never stepped foot on a board of any kind, or whether you are a seasoned kitesurfer looking for rentals and extra tips, Anguilla Watersports offers it all. For beginners, Judd starts at the very top, teaching you all about the wind, your equipment and techniques. I tagged along with Judd one morning to find out what a lesson entails. I've watched him and his friends kitesurf up and down the windswept Savannah Bay for years, but never knew the ins and outs of what goes into reaching that expert kitesurfing skill level. Developing a solid kitesurfing ability starts on the sand. No jumping into the sea, feet strapped to a board, without preparation and sound explanations of everything involved! 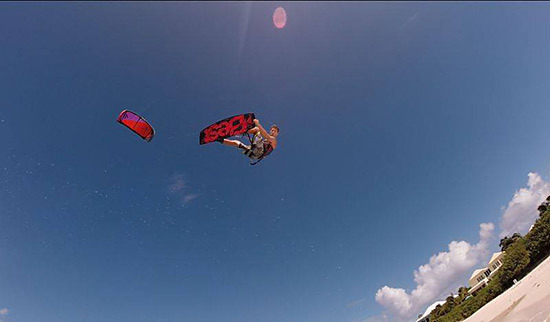 Kitesurfing is all about harnessing the power of the wind to propel yourself across the sea. The first aspect to the lesson is learning wind-awareness. Which direction the wind is blowing and how to best position yourself to it is critical. Judd also explains the difference between traveling upwind, downwind and how exactly to get upwind/downwind. If you have sailing experience, or have taken even just one sailing lesson, it is immensely helpful. Listening to Judd talk about the "wind window" reminded me of "wind clocks" from sailing lessons back in the day. It is easy to get the hang of. Next in the lesson? The kite! 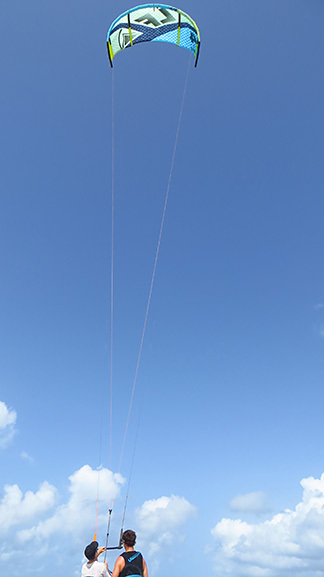 Setting your kite's lines, attaching them to your harness and launching your kite follows. On the sand, the kite high above, you adjust the kite to the wind, getting the feel for the kite while on dry land. Without a board, the next step is understanding the motion of the kite and how to adjust your grip and position relative to where the wind is blowing. Big and holding a lot of power, getting the feel of the kite is an important step to master. Once Judd provides a demonstration in the sea (see photo to the right), you both jump into the water together (see photo below). Having Judd in the water with you keeps you out of harm's way until the kitesurfing technique becomes second nature. A true pro, you are always in safe hands with Judd. His IKO-certification is apparent as he never misses a beat with providing advice on how to adjust your kite and keep it high in the air. When it does fall into the sea (or even the sand!) he's there to show you how to angle your grip to get it back above the ocean. Everything under control so far? Now, it's your turn to try it alone! Judd's never out of reach, though, keeping a close eye and providing coaching from shore. From my perspective, a kitesurfing novice and intermediate surfer, there is a lot of information to digest. With surfing you might be able to grab a board and paddle out to the line up, but kitesurfing requires more patience and instruction. Luckily, Judd is an effective teacher. He breaks it down into easy to learn steps, tackling one at a time. Getting the basics down takes one lesson at most. After that? It's onto the board! 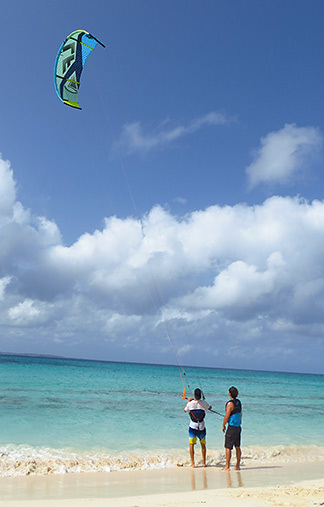 Gazing at the kite high in the sky, the water underfoot, it is a remarkable sport rich with adventure and beauty. 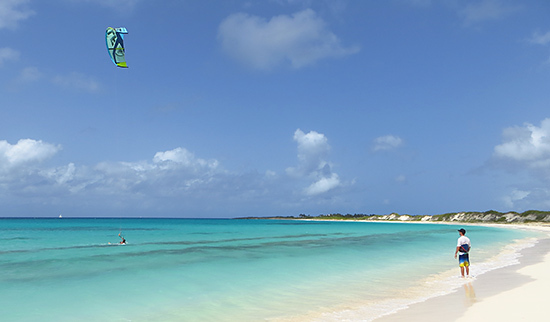 Details on my Anguilla kitesurfing adventure coming soon! 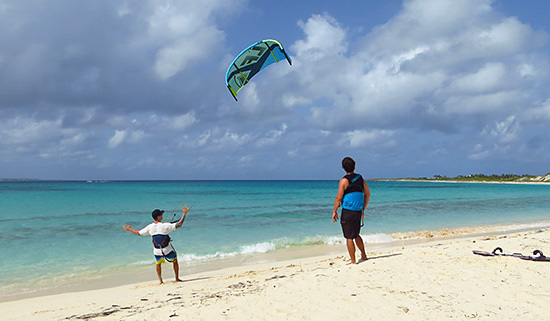 Many of the top kitesurfers here in Anguilla seek out spots like Savannah Bay, with more wind and waves, that provide the ultimate thrill. Judd High Above The Sea! 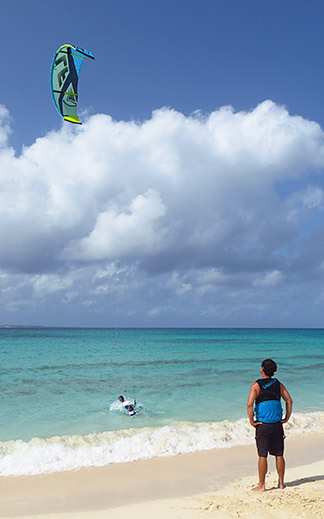 Whether you're seeking something extreme or just want to take a kite out on your own in a calmer bay, Anguilla Watersports rents kitesurfing equipment to experienced kiteboarders. 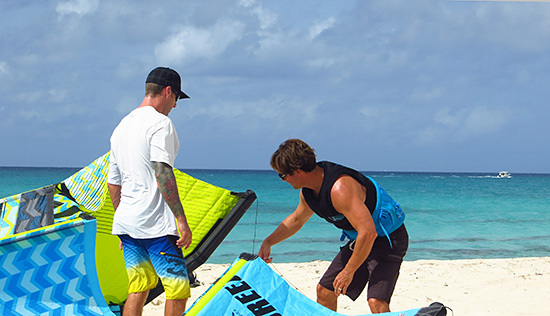 This including kites, pumps, harnesses, kiteboards and surfboards for the advanced riders. They will deliver it all to your hotel/villa and pick it up, too! What do we do when the sea goes flat and the wind takes a breather (or simply when we're in a more laidback mood)? 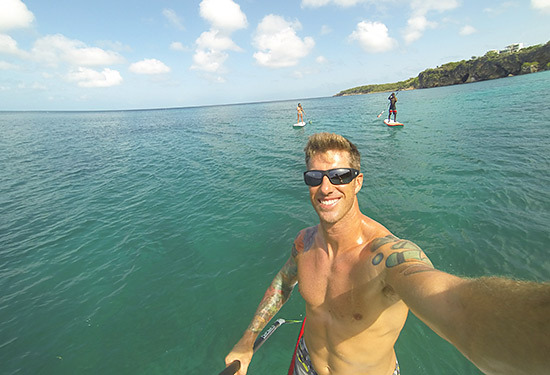 It used to be that you could only stand up paddleboard at spots that rented them on site. 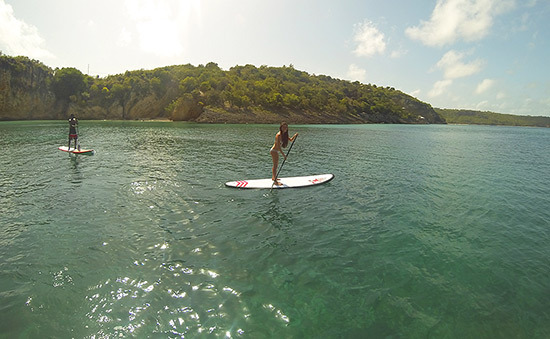 Anguilla Watersports on the other hand will deliver paddle boards to you anywhere on the island. 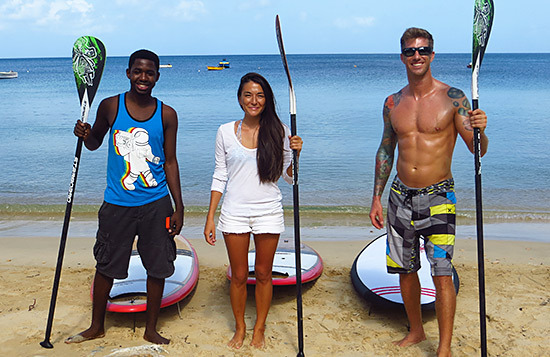 Kirmani (our Anguilla-Beaches.com intern) and I recently joined Judd for a little stand up paddleboarding. Sunny and calm, conditions called for an idyllic morning on the sea. Already on the beach when Kirmani and I arrived, the pristine boards glistened in the sun. Judd showed us how to carry the boards (simply by the handle located in the middle of the board) and how to launch them in the water. Being mindful of the board's fins, the sand and waves, are key when launching the board into the sea. 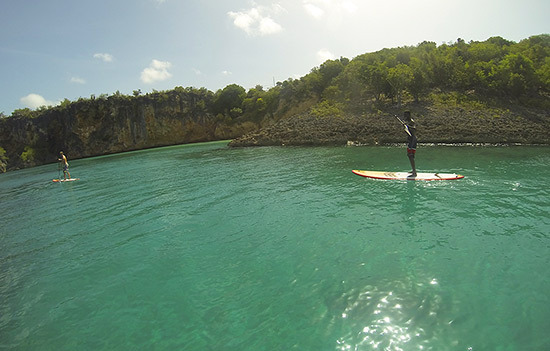 His first time on a paddleboard, Kirmani found the advice helpful. "All ready? Now climb onto the board from the side and pop up like this," Judd instructed. Quick and simple! In just a few minutes Kirmani and I were on our way, Judd following closely behind. We were Little Bay bound! If you crave tranquility, peace and the ocean, it doesn't get much better than this. 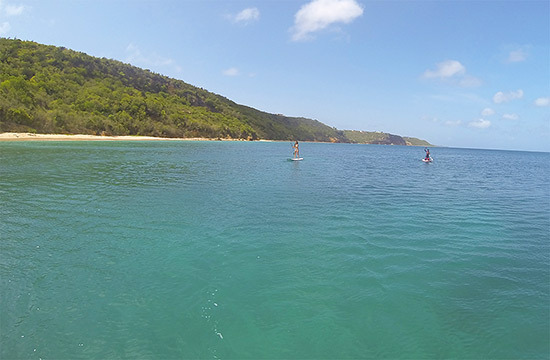 Gliding above glassy seas, an SUP is truly a front row seat to the most mesmerizing ocean show... turtles surfacing for air, stingrays flying through the blue, fish jumping high above the water. Without the noise of motors, powered by your own body, it's a soothing experience. Rounding the edge of Crocus Bay, with its magnificent high cliffs, the sights above sea-level are beautiful too. The high cliffs flanked our right side as we moved closer and closer to that bay bathed in a unique sea-green hue in the distance... Little Bay. There is something magical about this little cove, tucked into Anguilla's rocky cliffside. A tiny spit of sand meets crystal-clear waters, surrounded by dauntingly high, jagged rocks. Only accessible by watercraft or rope, its exclusivity keeps it so coveted. We paddled around the bay, contemplating jumping off "The Rock," a 20' boulder to the bay's edge. It's perfect for diving and high jumping if you're seeking a good thrill. But today wasn't about chasing adrenaline. It was about blissfully paddling on. 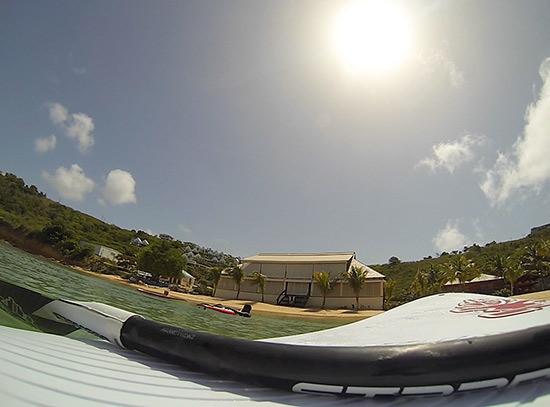 Stable and steady, Anguilla Watersports' boards are in beautiful condition. Wide, long, with grips under you feet, Judd chooses your board and paddle based on your height. Customized to your size, it makes for effortless gliding across the sea. 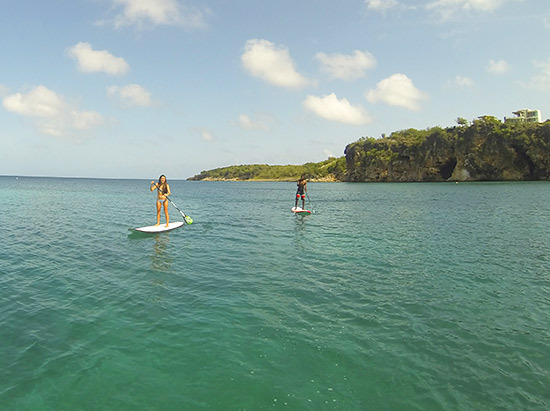 With the wind picking up ever so slightly, we decided to paddle back to Crocus Bay to explore the coast closer to shore. "If the wind keeps growing, it will be a tougher paddle back," Judd warned. 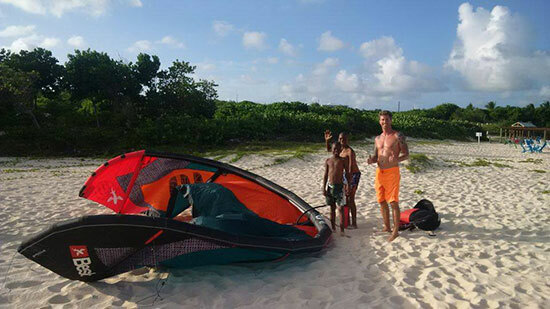 Knowing wind and waves well in Anguilla, and with safety front and center, Judd always know what to do. Leading the pack, we followed him back. But, before getting all the way out of Crocus Bay, Judd had a gleam in his eye. "You know, the next calm day we get, we should come back and paddle all the way to Shoal Bay East." Always the adventurer! Hopefully next time! As we made our way to Crocus, Judd gave Kirmani and I tips on how to optimize our paddling. He showed us how to get the most distance out of each paddle. 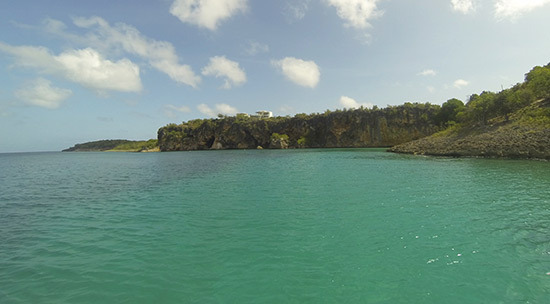 Before we knew it, we were back to Crocus Bay. Beyond all of Crocus' bobbing boats, with hundreds of yards of ocean in front of you, and the beach just beyond, it is a special sight. 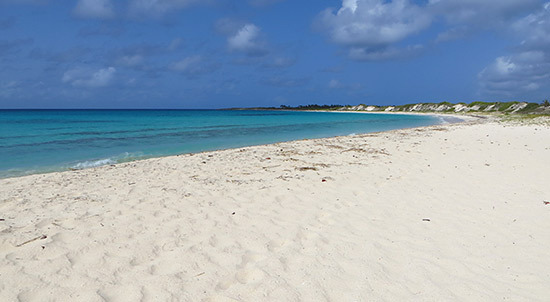 Seeing Anguilla from the sea truly heightens all appreciation for the island's beauty. Finally, the sun lower in the sky than when we had left, it was back to shore. Sand glistening, palms swaying, salty and refreshed after a serene morning on sea... it's moments like these that you remember forever. When all was said and done, Judd packed up the boards and we were on our way. Such a positive guy with great energy, Judd delivers an unforgettable experience. 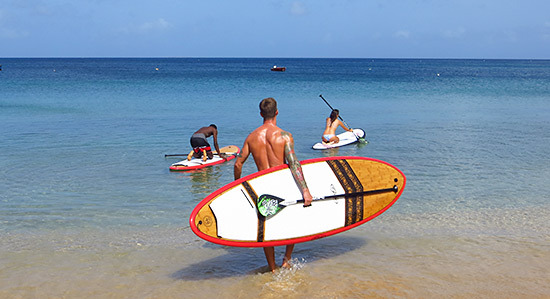 In addition to tours, Anguilla Watersports also rents boards. They deliver your boards and pick them all up, too. Eating lunch at Gwen's? Or Smokey's? Want to go for a post-meal paddle? No problem. Hotel? Villa? Sure thing. Judd and his team will also show you how to use the boards and provide local information on where you're planning on paddling. Quality boards, expert tips and professional service. Thank you for a memorable morning, Judd. See you out on the water again soon! Rates vary depending on the sport and if you are taking a tour/lesson or renting equipment. 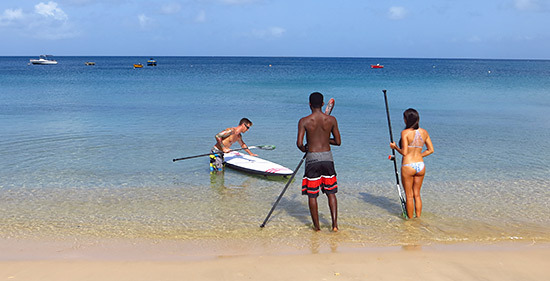 For the most up to date rates, visit Anguilla Watersports' official website here.